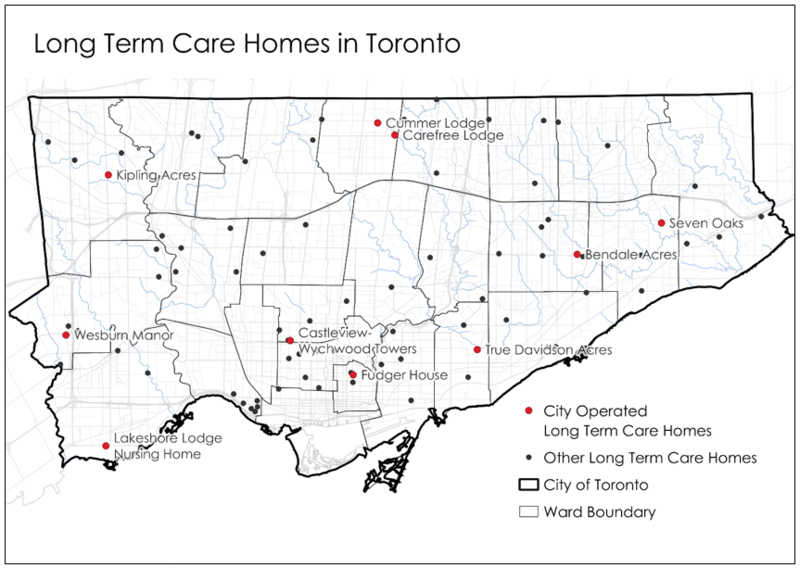 Within the city, 52 different organizations operate 84 long-term care homes with 15,222 beds. Long-Term Care Homes & Services (LTCHS), under provincial legislation, directly operates ten long-term care homes with 2,641 beds. The homes have a diverse resident population (66 countries of origin, 31 languages) and complex care requirements (64 percent of residents have some form of dementia). The City’s directly operated long-term care bed inventory has remained unchanged since 1993 and is not keeping pace with demand. City staff, as directed by City Council, are in discussions with provincial officials to improve capital and operating funding for long-term care homes and to strengthen the City’s role in service planning. A progress report will go to Council in 2019. Admission to long-term care homes in Ontario, including those operated by the municipality, is administered through Home and Community Care in the Local Health Integration Networks (LHINs). Beds are licensed (for private and non-profit operators) or approved (for municipalities) by the Ministry of Health and Long-Term Care (MOHLTC). Toronto’s aging demographic is diverse in regards to health, income, ethno-racial background, family status and mobility. Though many seniors remain active and in their community, frail and vulnerable seniors need extra care and support. This care is often provided through municipal services, including long-term care homes, and community-based services. As the population ages and lives longer with more complex care needs, more individuals and families will need these services and supports which will place additional pressures on already strained resources. For example, all long-term care homes, including those that are directly-operated by the City, have waitlists. Depending on the home, it may take between one and six years for an offer of admission. Mandatory requirements to meet new design standards affect all provincial operators, both private and not-for-profits. Several operators located within the City of Toronto’s boundaries have signalled to the Province of Ontario their intention to move from Toronto, mainly due to the cost of land, or cease operations rather than redevelop. In November 2015, City Council approved the Long-Term Care Homes & Services (LTCHS) Capital Renewal Plan to address the mandatory redevelopment of City operated homes to meet new provincial design standards and modernized environments. The plan includes the George Street Revitalization (GSR) project, which is a co-location opportunity for a new emergency shelter, long-term care home, transitional living, affordable housing and community hub to better meet the needs of vulnerable individuals on the current Seaton House site. While the LTCHS Capital Renewal Plan was designed based on the existing bed inventory, it is feasible to increase capacity through larger vertical communities with affordable housing, community hubs and co-located City services to address the needs of vulnerable and aging populations. In May 2018, City Council established a goal for the City to add at least 786 more long-term care beds at five existing City-owned and operated long-term care homes.